Collection, Department of Rare Books and Special Collections, Princeton University Library. If you look closely at H.H. 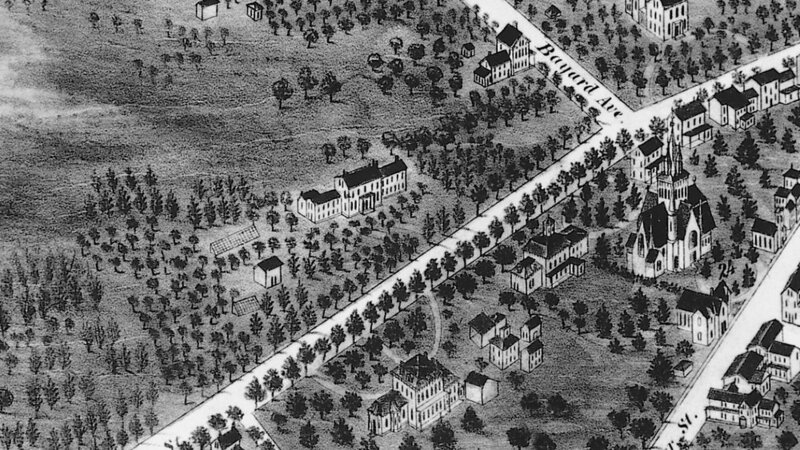 Bailey’s 1874 Bird’s Eye View of Princeton, N.J., you can make out a small glass greenhouse sitting just west of Morven (circled above). Research done in the 2000s revealed that Commodore Robert F. Stockton (1795-1866) had built the greenhouse during his tenure. Account books showed that the Commodore had paid for the installation of gutters on the building in October 1854, placing its construction at roughly 1852-54. An inventory upon his death indicated that the greenhouse contained 15 lemon trees, 100 Japonicas, 10 cacti, 4 azaleas, 3 Daphnes and “Misc. plants.” Based on research it is believed the greenhouse was torn down in the 1880s. Little else was known about the greenhouse until a 2013 archaeological dig conducted by Hunter Research, Inc. uncovered the brick and stone foundation of the structure - sitting just where the bird’s eye view indicated. Excavations over the next two summers uncovered thousands of cultural artifacts, including the remains of the cast iron furnace which heated the greenhouse, and glass from the window panes that allowed sunlight in. The greenhouse denotes the refined gentleman’s pastime of the Commodore, reflecting his stature and financial standing to enjoy such a hobby. Maintaining the structure and the plants within would have likely involved a trained gardener and help from farm hands. Morven is partnering with the archaeologists at Hunter Research to help bring the Commodore’s greenhouse to life. In an exhibition opening in February 2018, Morven will explore the history of the Commodore’s greenhouse - presenting archaeological artifacts, contemporary greenhouse designs, and a study of popular plants that the Commodore may have grown. This exhibit will give Morven a wonderful opportunity to focus on its unique garden history, placing it with the context of American nineteenth century greenhouse architecture and practice.